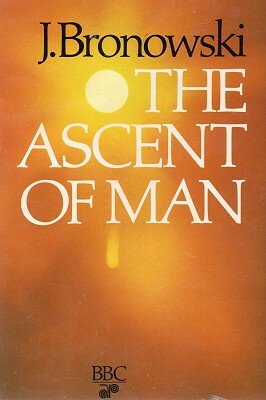 The Ascent of Man: 1, 1973. Man is a singular creature. He has a set of gifts which make him unique among the animals: so that, unlike them, he is not a figure in the landscape - he is a shaper of the landscape. In body and in mind he is the explorer of nature, the ubiquitous animal, who did not find but has made his home in every continent. It is reported that when the Spaniards arrived overland at the Pacific Ocean in 1769 the California Indians used to say that at full moon the fish came and danced on these beaches. And it is true that there is a local variety of fish, the grunion, that comes up out of the water and lays its eggs above the normal high-tide mark. The females bury themselves tail first in the sand and the males gyrate round them and fertilise the eggs as they are being laid. The full moon is important, because it gives the time needed for the eggs to incubate undisturbed in the sand, nine or ten days, between these very high tides and the next ones that will wash the hatched fish out to sea again. 1. Millions of years of evolution have shaped the grunion to fit and sit exactly with the tides. Every landscape in the world is full of these exact and beautiful adaptations, by which an animal fits into its environment like one cog-wheel into another. The sleeping hedgehog waits for the spring to burst its metabolism into life. The humming-bird beats the air and dips its needle-fine beak into hanging blossoms. Butterflies mimic leaves and even noxious creatures to deceive their predators. The mole plods through the ground as if he had been designed as a mechanical shuttle. So millions of years of evolution have shaped the grunion to fit and sit exactly with the tides. But nature - that is, biological evolution - has not fitted man to any specific environment. On the contrary, by comparison with the grunion he has a rather crude survival kit; and yet - this is the paradox of the human condition - one that fits him to all environments. Among the multitude of animals which scamper, fly, burrow and swim around us, man is the only one who is not locked into his environment. His imagination, his reason, his emotional subtlety and toughness, make it possible for him not to accept the en­vironment but to change it. And that series of inventions, by [Page 20]which man from age to age has remade his environment, is a different kind of evolution - not biological, but cultural evolu­tion. I call that brilliant sequence of cultural peaks The Ascent of Man. I use the word ascent with a precise meaning. Man is distinguished from other animals by his imaginative gifts. He makes plans, inventions, new discoveries, by putting different talents together; and his discoveries become more subtle and penetrating, as he learns to combine his talents in more complex and intimate ways. So the great discoveries of different ages and different cultures, in technique, in science, in the arts, express in their progression a richer and more intricate conjunction of human faculties, an ascending trellis of his gifts. Of course, it is tempting - very tempting to a scientist - to hope that the most original achievements of the mind are also the most recent. And we do indeed have cause to be proud of some modern work. Think of the unravelling of the code of heredity in the DNA spiral; or the work going forward on the special faculties of the human brain. Think of the philosophic insight that saw into the Theory of Relativity or the minute behaviour of matter on the atomic scale. Yet to admire only our own successes, as if they had no past (and were sure of the future), would make a caricature of know­ledge. For human achievement, and science in particular, is not a museum of finished constructions. It is a progress, in which the first experiments of the alchemists also have a formative place, and the sophisticated arithmetic that the Mayan astronomers of Central America invented for themselves independently of the Old World. The stonework of Machu Picchu in the Andes and the geometry of the Alhambra in Moorish Spain seem to us, five centuries later, exquisite works of decorative art. But if we stop our appreciation there, we miss the originality of the two cultures that made them. Within their time, they are constructions as arresting and important for their peoples as the architecture of DNA for us. In every age there is a turning-point, a new way of seeing and asserting the coherence of the world. 3. The dry savannah became a trap in time as well as space. It is frozen in the statues of [Pages 21-23, 24] Easter Island that put a stop to time - and in the medieval clocks in Europe that once also seemed to say the last word about the heavens for ever. 4. For the origins of man, this is a possible area. the bottom level is four million years old. these strata from well over two million years ago. I have chosen this place because it has a unique structure. In this valley was laid down, over the last four million years, layer upon layer of volcanic ash, interbedded with broad bands of shale and mudstone. The deep deposit was formed at different times, one stratum after another, visibly separated according to age: four million years ago, three million years ago, over two million years ago, somewhat under two million years ago. And then the Rift Valley buckled it and stood it on end, so that now it makes a map in time, which we see stretching into the distance and the past. The record of time in the strata, which is usually buried underfoot, has been tip-tilted in the cliffs that flank the Omo, and spread out like the ribs of a fan. These cliffs are the strata on edge: in the foreground the bottom level, four million years old, and beyond that the next lowest, well over three million years old. The remains of a creature like man appear beyond that, and the remains of the animals that lived at the same time. The animals are a surprise, because it turns out that they have changed so little. When we find in the sludge of two million years ago the fossils of the creature who was to become man, we are struck by the differences between his skeleton and ours - by the development of the skull, for instance. So, naturally, we expect the animals of the savannah also to have changed greatly. But the fossil record in Africa shows that this is not so. Look as the hunter does at the Topi antelope now. The ancestor of man that hunted its ancestor two million years ago would at once recognise the Topi today. But he would not recognise the hunter today, black or white, as his own descendant. 5. Modern and fossil nyala horns from Omo. The fossil horns are over two million years old. Yet it is not hunting in itself (or any other single pursuit) that has changed man. For we find that among the animals the hunter has changed as little as the hunted. The serval cat is still powerful in pursuit, and the oryx is still swift in flight; both perpetuate the same relation between their species as they did long ago. Human evolution began when the African climate changed to drought: the lakes shrank, the forest thinned out to savannah. And evidently it was fortunate for the forerunner of man that he was not well adapted to these conditions. For the environment exacts a price for the survival of the fittest; it captures them. When [Page 27, 28] animals like Grevy's zebra were adapted to the dry savannah, it became a trap in time as well as space; they stayed where they were, and much as they were. The most gracefully adapted of all these animals is surely Grant's gazelle; yet its lovely leap never took it out of the savannah. In a parched African landscape like Omo, man first put his foot to the ground. That seems a pedestrian way to begin the Ascent of Man, and yet it is crucial. Two million years ago, the first certain ancestor of man walked with a foot which is almost indistinguishable from the foot of modern man. The fact is that when he put his foot on the ground and walked upright, man made a commitment to a new integration of life and therefore of his limbs. The one to concentrate on, of course, is the head, because of all human organs it has undergone the most far-reaching and formative changes. Happily, the head leaves a lasting fossil (unlike the soft organs), and though it is less informative about the brain than we should like, at least it gives us some measure of its size. A number of fossil skulls have been found in Southern [Page 29] Africa in the last fifty years which establish the characteristic structure of the head when it began to be man-like. 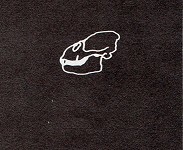 Plate 6 shows what it looked like over two million years ago. 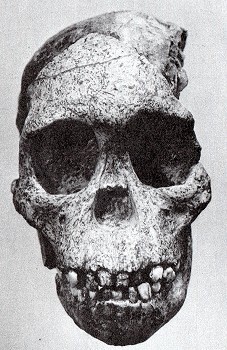 It is a historic skull, found not at Omo, but south of the equator at a place called Taung, by an anatomist called Raymond Dart. It is a baby, five to six years old, and though the face is nearly complete, part of the skull is sadly missing. In 1924 it was a puzzling find, the first of its kind, and was treated with caution even after Dart's pioneering work on it. from which the whole adventure of man began. 7. The ancestor of man had a short thumb, and therefore could not manipulate very delicately. Yet Dart instantly recognised two extraordinary features. One is that the foramen magnum (that is, the hole in the skull that the spinal cord comes up through to the brain) is upright; so that this was a child that held its head up. That is one man-like feature; for in the monkeys and apes the head hangs forward from the spine, and does not sit upright on top of it. And the other is the teeth. The teeth are always tell-tale. Here they are small, they are square - these are still the child's milk teeth - they are not the great, fighting canines that the apes have. That means that this was a creature that was going to forage with its hands and not its mouth. The evidence of the teeth also implies that it was probably eating meat, raw meat; and so the hand-using creature was almost certainly making tools, pebble-tools, stone choppers, to carve it and to hunt. Dart called this creature Australopithecus. It is not a name that I like; it just means Southern Ape, but it is a confusing name for an African creature that for the first time was not an ape. I suspect that Dart, who was born in Australia, put a pinch of mischief into his choice of the name. It took ten years before more skulls were found - adult skulls now - and it was not until late in the 1950s that the story of Australopithecus was substantially pieced together. 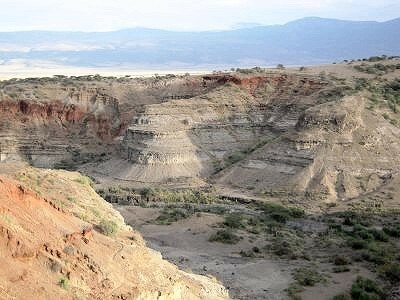 It started in South Africa, then it moved north to Olduvai Gorge in Tanzania, and most recently the richest finds of fossils and tools have turned up in the basin of Lake Rudolf. This history is one of the scientific delights of the century. It is every bit as exciting as the discoveries in physics before 1940, and those in biology since 1940; and it is as rewarding as either of those in the light that it throws on our nature as human beings. For me, the little Australopithecus baby has a personal history. In 1950, when its humanity was by no means accepted, I was asked to do a piece of mathematics. 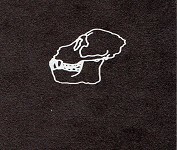 Could I combine a measure of the size of the Taung child's teeth with their shape, so as to discriminate them from the teeth of apes? I had never held a fossil skull in my hands, and I was by no means an expert on teeth. But it worked pretty well; and it transmitted to me a sense of excitement which I remember at this instant. I, at over forty, having spent a lifetime in doing abstract mathematics about the shapes of things, suddenly saw my knowledge reach back two million years and shine a searchlight into the history of man. And from that moment I was totally committed to thinking about what makes man what he is: in the scientific work that I have done since then, the literature that I have written, and in these programmes. How did the hominids come to be the kind of man that I honour: dexterous, observant, thoughtful, passionate, able to manipulate in the mind the symbols of language and mathematics both, the visions of art and geometry and poetry and science? How did the ascent of man take him from those animal beginnings to that rising enquiry into the workings of nature, that rage for knowledge, of which these essays are one expression? I do not know how the Taung baby began life, but to me it still remains the primordial infant from which the whole adventure of man began. The human baby, the human being, is a mosaic of animal and angel. For example, the reflex that makes the baby kick is already there in the womb - every mother knows that - and it is there in all vertebrates. The reflex is self-sufficient, but it sets the stage for more elaborate movements, which have to be practised before they become automatic. Here by eleven months it urges the baby to crawl. That brings in new movements, and they then lay down and consolidate the pathways in the brain (specifically the cerebellum, where muscular action and balance are integrated) that will form a whole repertoire of subtle, complex movements and make them second nature to him. Now the cerebellum is in control. All that the conscious mind has to do is to issue a command. 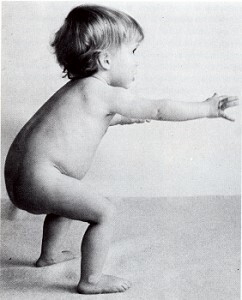 The child has entered the human commitment to walk upright. 8. 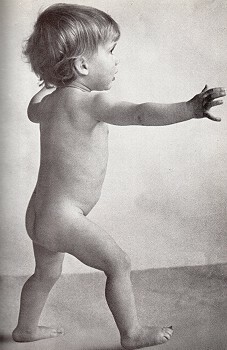 Fourteen-month-old child just beginning to walk. Every human action goes back in some part to our animal origins; we should be cold and lonely creatures if we were cut off from that blood-stream of life. Nevertheless, it is right to ask for a distinction: What are the physical gifts that man must share with the animals, and what are the gifts that make him different? Consider any example, the more straightforward the better - say, the simple action of an athlete when running or jumping. 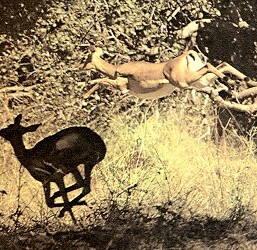 When [Page 32] he hears the gun, the starting response of the runner is the same as the flight response of the gazelle. He seems all animal in action. The heartbeat goes up; when he sprints at top speed the heart is pumping five times as much blood as normal, and ninety per cent of it is for the muscles. He needs twenty gallons of air a minute now to aerate his blood with the oxygen that it must carry to the muscles. The violent coursing of the blood and intake of air can be made visible, for they show up as heat on infra-red films which are sensitive to such radiation. The flush that we see and that [Page 33, 34, 35] the infra-red camera analyses is a by-product that signals the limit of muscular action. For the main chemical action is to get energy for the muscles by burning sugar there; but three-quarters of that is lost as heat. And there is another limit, on the runner and the gazelle equally, which is more severe. At this speed, the chemical burn-up in the muscles is too fast to be complete. The waste products of incomplete burning, chiefly lactic acid, now foul up the blood. This is what causes fatigue, and blocks the muscle action until the blood can be cleaned with fresh oxygen. So far, there is nothing to distinguish the athlete from the gazelle - all that, in one way or another, is the normal metabolism of an animal in flight. But there is a cardinal difference: the runner was not in flight. The shot that set him off was the starter's pistol, and what he was experiencing, deliberately, was not fear but exaltation. The runner is like a child at play; his actions are an adventure in freedom, and the only purpose of his breathless chemistry was to explore the limits of his own strength. Naturally there are physical differences between man and the other animals, even between man and the apes. 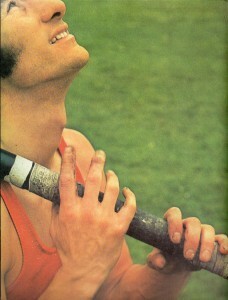 In the act of vaulting, the athlete grasps his pole, for example, with an exact grip that no ape can quite match. Yet such differences are secondary by comparison with the overriding difference, which is that the athlete is an adult whose behaviour is not driven by his immediate environment, as animal actions are. In themselves, his actions make no practical sense at all; they are an exercise that is not directed to the present. The athlete's mind is fixed ahead of him, building up his skill; and he vaults in imagination into the future. Poised for that leap, the pole-vaulter is a capsule of human abilities: the grasp of the hand, the arch of the foot, the muscles of the shoulder and pelvis - the pole itself, in which energy is stored and released like a bow firing an arrow. The radical character in that complex is the sense of foresight, that is, the ability to fix an objective ahead and rigorously hold his attention on it. The athlete's performance unfolds a continued plan; from one extreme to the other, it is the invention of the pole, the concentration of the mind at the moment before leaping, which give it the stamp of humanity. 9. The athlete's mind is fixed ahead of him, building up his skill; and he he vaults in a into the future. Athlete: about to vault and at climax of action. 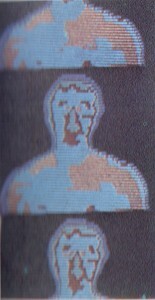 Infra-red photograph of the head and torso of a fatigued athlete. The head is more than a symbolic image of man; it is the seat of foresight and, in that respect, the spring which drives cultural evolution. Therefore if I am to take the ascent of man back to its beginnings in the animal, it is the evolution of the head and the skull that has to be traced. Unhappily, over the fifty million years or so to be talked about, there are only six or seven essentially distinct skulls which we can identify as stages in that evolution. Buried in the fossil record there must be many other intermediate [Page 37] steps, some of which will be found; but meanwhile we must conjecture what happened, approximately, by interpolating between the known skulls. 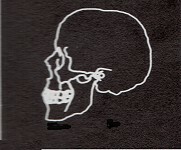 The best way to calculate these geometrical transitions from skull to skull is on a computer; so that, in order to trace the continuity, I present them on a computer with a visual display which will lead from one to the next. 10. The head is the spring which drives cultural evolution. 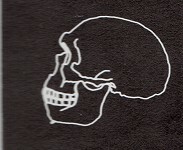 Computer-graphic display of stages in evolution of the head. Begin fifty million years ago with a small tree-dwelling creature, a lemur; the name, appropriately, is that of the Roman spirits of the dead. The fossil skull belongs to the lemur family Adapis, and was found in chalky deposits outside Paris. When the skull is turned upside down, you can see the foramen magnum far at the back - this is a creature that hung, not held, its head on the spine. The likelihood is that it ate insects as well as fruits, and it has more than the thirty-two teeth that man and most primates now have. 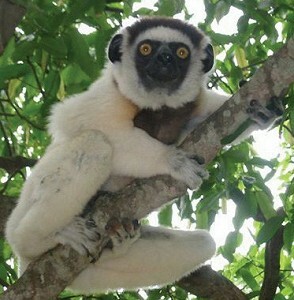 The fossil lemur has some essential marks of the primates, that is, the family of monkey, ape and man. From remains of the whole skeleton we know that it has finger nails, not claws. It has a thumb that can be opposed at least in part to the hand. 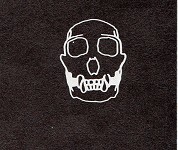 And it has in the skull two features that really mark the way to the beginning of man. The snout is short; the eyes are large and widely spaced. That means that there has been selection against the sense of smell and in favour of the sense of vision. The eye-sockets are still rather sideways in the skull, on either side of the snout; but compared with the eyes of earlier insect eaters, the lemur's have begun to move to the front and to give some stereoscopic vision. These are small signs of an evolutionary development towards the sophisticated structure of the human face; and yet, from that, man begins. and fruit-eaters like the lemurs. a close relation of the lemur. That was fifty million years ago, in very round figures. In the next twenty million years, the line that leads to the monkeys branches away from the main line to the apes and man. The next creature on the main line, thirty million years ago, was the fossil skull found in the Fayum in Egypt, and named Aegyptopithecus. He has a shorter snout than the lemur, his teeth are ape-like, and he is larger - yet still lives in the trees. But from now on the ancestors of the apes and man spent part of their time on the ground. Another ten million years on take us to twenty million years ago, when there were what we should now call anthropoid apes in East Africa, Europe and Asia. 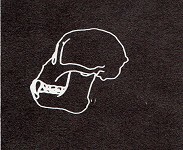 A classical find made by Louis Leakey goes by the dignified name of Proconsul, and there was at least one other widespread genus, Dryopithecus. The brain is markedly larger, the eyes are now fully forward in stereoscopic vision. These developments tell us how the main ape-and-man line was moving. But if, as is possible, it had already branched again, then so far as man is concerned, alas, this creature is on the branch line -the ape line. 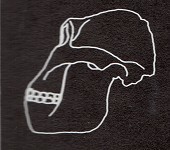 The teeth show us that he is an ape, because the way in which the jaw is locked by the big canines is not man-like. 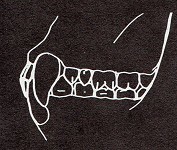 It is the change in the teeth that signals the separation of the line that leads to man, when it comes. 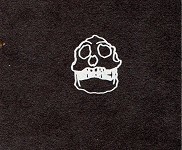 The first harbinger that we have is Ramapithecus, found in Kenya and in India. This creature is fourteen million years old, and we only have pieces of the jaw. But it is clear that the teeth are level and more human. The great canines of the anthropoid apes are gone, the face is much flatter, and we are evidently near a branching of the evolutionary tree; some anthropologists would boldly put Ramapithecus among the hominids. There is now a blank in the fossil record of five to ten million years. Inevitably, the blank hides the most intriguing part of the story, when the hominid line to man is firmly separated from the line to the modern apes. But we have found no unequivocal record of that, yet. Then, perhaps five million years ago, we come certainly to the relatives of man. A cousin of man, not in the direct line to us, is a heavily-built Australopithecus who is a vegetarian. Australopithecus robustus is manlike and his line does not lead elsewhere; it has simply become extinct. The evidence that he lived on plants is again in his teeth, and it is quite direct: the teeth that survive are pitted by the fine grit that he picked up with the roots that he ate. His cousin on the line to man is lighter - visibly so in the jaw - and is probably a meat-eater. He is the nearest thing we have to [page 40] what used to be called the 'missing link': Australopithecus africanus, one of a number of fossil skulls found at Sterkfontein in the Transvaal and elsewhere in Africa, a fully grown female. The Taung child, with which I began, would have grown up to be like her; fully erect, walking, and with a largish brain weighing between a pound and a pound and a half. That is the size of the brain of a big ape now; but of course this was a small creature standing only four feet high. Indeed, recent finds by Richard Leakey suggest that by two million years ago the brain was larger even than that. And with that larger brain the ancestors of man made two major inventions, for one of which we have visible evidence and for the other inferential evidence. Two million years ago Australopithecus made rudimentary stone tools where a simple blow has put an edge on the pebble. And for the next million years, man in his further evolution did not change this type of tool. He had made the fundamental invention, the purposeful act which prepares and stores a pebble for later use. By that lunge of skill and foresight, a symbolic act of discovery of the future, he had released the brake which the environment imposes on all other creatures. It was held in a simple way, by pressing its thick end against the palm of the hand in a power-grip. And, of course, it is a meat-eater's tool almost certainly, to strike and to cut. 11. The steady use of the same tool for so long shows the strength of the invention. Acheulian hand axe of Homo rectus. The other invention is social, and we infer it by more subtle arithmetic. Skulls and skeletons of Australopithecus that have now been found in largish numbers show that most of them died before the age of twenty. That means that there must have been many orphans. For Australopithecusssurely had a long childhood, as all the primates do; at the age of ten, say, the survivors were still children. Therefore there must have been a social organisation in which children were looked after and (as it were) adopted, were made part of the community, and so in some general sense were educated. That is a great step towards cultural evolution. At what point can we say that the precursors of man become man himself? That is a delicate question, because such changes do not take place overnight. It would be foolish to try and make them seem more sudden than they really were - to fix the transition too sharply or to argue about names. Two million years ago we were not yet men. One million years ago we were, because by one million years ago a creature appears who can be called Homo —Homo erectus. He spreads far beyond Africa. The classical find of Homo erectus was in fact made in China. He is Peking man, about four hundred thousand years old, and he is the first creature that certainly used fire. The changes in Homo erectus that have led to us are substantial over a million years, but they seem gradual by comparison with those that went before. The successor that we know best was first found in Germany in the last century: another classic fossil skull, he is Neanderthal man. He already has a three-pound brain, as large as modern man. Probably some lines of Neanderthal man died out; but it seems likely that a line in the Middle East went on directly to us, Homo sapiens. Somewhere in that last million years or so, man made a change in the quality of his tools - which presumably points to some biological refinement in the hand during this period, and especially in the brain centres that control the hand. The more sophisticated creature (biologically and culturally) of the last half million years or so could do better than copy the ancient stone choppers that went back to Australopithecus. He made tools which require much finer manipulation in the making and, of course, in the use. The development of such refined skills as this and the use of fire is not an isolated phenomenon. On the contrary, we must always remember that the real content of evolution (biological as well as cultural) is the elaboration of new behaviour. It is only because behaviour leaves no fossils that we are forced to search for it in bones and teeth. Bones and teeth are not interesting in themselves, even to the creature to whom they belong; they serve him as equipment for action - and they are interesting to us because, as equipment, they reveal his actions, and changes in equipment reveal changes in behaviour and skill. For this reason, changes in man during his evolution did not take place piecemeal. 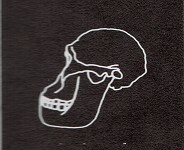 He was not put together from the cranium of one primate and the jaw of another - that misconception is too naive to be real, and only makes a fake like the Piltdown skull. Any animal, and man especially, is a highly integrated structure, all the parts of which must change together as his behaviour changes. The evolution of the brain, of the hand, of the eyes, of the feet, the teeth, the whole human frame, made a mosaic of special gifts - and in a sense these chapters are each an essay on some special gift of man. They have made him what he is, faster in evolution, arid richer and more flexible in behaviour, than any other animal. Unlike the creatures (some insects, for instance) that have been unchanged for five, ten, even fifty million years, he has changed over this time-scale out of all recognition. Man is not the most majestic of the creatures. Long before the mammals even, the dinosaurs were far more splendid. But he has what no other animal possesses, a jig-saw of faculties which alone, over three thousand million years of life, make him creative. Change in diet is important in a changing species over a time as long as fifty million years. The earliest creatures in the sequence leading to man were nimble-eyed and delicate-fingered insect and fruit eaters like the lemurs. Early apes and hominids, from Acgyptopithccus and Proconsul to the heavy Australopithecus, are thought to have spent their days rummaging mainly for vegetarian foods. But the light Australopithecus broke the ancient primate habit of vegetarianism. The change from a vegetarian to an omnivorous diet, once made, persisted in Homo erectus, Neanderthal man and Homo sapiens. From the ancestral light Australopithecus onwards, the family of man ate some meat: small animals at first, larger ones later. Meat is a more concentrated protein than plant, and eating meat cuts down the bulk and the time spent in eating by two-thirds. The consequences for the evolution of man were far-reaching. He had more time free, and could spend it in more indirect ways, to get food from sources (such as large animals) which could not be [Page 43, 44, 45] tackled by hungry brute force. Evidently that helped to promote (by natural selection) the tendency of all primates to interpose an internal delay in the brain between stimulus and response, until it developed into the full human ability to postpone the gratification of desire. But the most marked effect of an indirect strategy to enhance the food supply is, of course, to foster social action and communication. A slow creature like man can stalk, pursue and corner a large savannah animal that is adapted for flight only by co-operation. Hunting requires conscious planning and organisation by means of language, as well as special weapons. Indeed, language as we use it has something of the character of a hunting plan, in that (unlike the animals) we instruct one another in sentences which are put together from movable units. The hunt is a communal undertaking of which the climax, but only the climax, is the kill. but only the climax, is the kill. eating together before the hunt. Hunting cannot support a growing population in one place; the limit for the savannah was not more than two people to the square mile. At that density, the total land surface of the earth could only support the present population of California, about twenty millions, and could not support the population of Great Britain. The choice for the hunters was brutal: starve or move. They moved away over prodigious distances. By a million years ago, they were in North Africa. By seven hundred thousand years ago, or even earlier, they were in Java. By four hundred thousand years ago, they had fanned out and marched north, to China in the east and Europe in the west. These incredible spreading migrations made man, from an early time, a widely dispersed species, even though his total numbers were quite small — perhaps one million. What is even more forbidding is that man moved north just after the climate there was turning to ice. In the great cold the ice, as it were, grew out of the ground. The northern climate had been temperate for immemorial ages - literally for several hundred million years. Yet before Homo erectus settled in China and northern Europe, a sequence of three separate Ice Ages began. The first was past its fiercest when Peking man lived in caves, four hundred thousand years ago. It is no surprise to find fire [Page 46] used in those caves for the first time. The ice moved south and retreated three times, and the land changed each time. The icecaps at their largest contained so much of the earth's water that the level of the sea fell four hundred feet. After the second Ice Age, over two hundred thousand years ago, Neanderthal man with his big brain appears, and he became important in the last Ice Age. The cultures of man that we recognise best began to form in the most recent Ice Age, within the last hundred or even fifty thousand years. That is when we find the elaborate tools that point to sophisticated forms of hunting: the spear-thrower, for example, and the baton that may be a straightening tool; the fully barbed harpoon; and, of course, the flint master tools that were needed to make the hunting tools. It is clear that then, as now, inventions may be rare but they spread fast through a culture. For example, the Magdalenian hunters of southern Europe fifteen thousand years ago invented the harpoon. In the early period of the invention, the Magdalenian harpoons were unbarbed; then they were barbed with a single row of fish hooks; and at the end of the period, when the flowering of cave art took place, they were fully barbed with a double row of hooks. The Magdalenian hunters decorated their bone tools, and they can be pinned to precise periods in time and to exact geographical locations by the refinement of style which they carry. They are, in a true sense, fossils that recount the cultural evolution of man in an orderly progression. 13. Fossils that recount the cultural evolution of man in an orderly progression. The barbs on the harpoon changed from a simple single row to the double rows during the last Ice Age. decorated with heads of hinds. came at the end of the last Ice Age. Man survived the fierce test of the Ice Ages because he had the flexibility of mind to recognise inventions and to turn them into community property. Evidently the Ice Ages worked a profound change in the way man could live. They forced him to depend less on plants and more on animals. The rigours of hunting on the edge of the ice also changed the strategy of hunting. It became less attractive to stalk single animals, however large. The better alternative was to follow herds and not to lose them - to learn to anticipate and in the end to adopt their habits, including their wandering migrations. This is a peculiar adaptation - the trans-humance mode of life on the move. It has some of the earlier qualities of hunting, because it is a pursuit; the place and the pace [Page 47, 48] are set by the food animal. And it has some of the later qualities of herding, because the animal is tended and, as it were, stored as a mobile reservoir of food. The transhumance way of life is itself a cultural fossil now, and has barely survived. 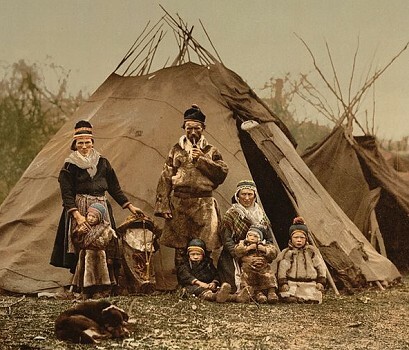 The only people that still live in this way are the Lapps in the extreme north of Scandinavia, who follow the reindeer as they did during the Ice Age. The ancestors of the Lapps may have come north from the Franco-Cantabrian cave area of the Pyrenees in the wake of the reindeer as the last icecaps retreated from southern Europe twelve thousand years ago. 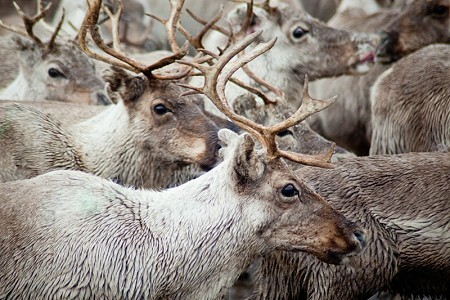 There are thirty thousand people and three hundred thousand reindeer, and their way of life is coming to an end even now. The herds go on their own migration across the fiords from one icy pasture of lichen to another, and the Lapps go with them. But the Lapps are not herdsmen; they do not control the reindeer, they have not domesticated it. They simply move where the herds move. is coining to an end. Even though the reindeer herds are in effect still wild, the Lapps have some of the traditional inventions for controlling single animals that other cultures also discovered: for example, they make some males manageable as draught animals by castrating them. It is a strange relationship. The Lapps are entirely dependent on the reindeer - they eat the meat, a pound a head each every day, they use the sinews and fur and hides and bones, they drink the milk, they even use the antlers. And yet the Lapps are freer than the reindeer, because their mode of life is a cultural adaptation and not a biological one. The adaptation that the Lapps have made, the transhumance life on the move in a landscape of ice, is a choice that they can change; it is not irreversible, as biological mutations are. For a biological adaptation is an inborn form of behaviour; but a culture is a learned form of behaviour - a communally preferred form, which (like other inventions) has been adopted by a whole society. and wild reindeer herds after confinement in winter quarters. There lies the fundamental difference between a cultural adaptation and a biological one; and both can be demonstrated in the Lapps. Making a shelter from reindeer hides is an adaptation that the Lapps can change tomorrow - most of them are [Page 49, 50] doing so now. By contrast the Lapps, or human lines ancestral to them, have also undergone a certain amount of biological adaptation. The biological adaptations in Homo sapiens are not large; we are a rather homogeneous species, because we spread so fast over the world from a single centre. Nevertheless biological differences do exist between groups of men, as we all know. We call them racial differences, by which we mean exactly that they cannot be changed by a change of habit or habitat. You cannot change the colour of your skin. Why are the Lapps white ? Man began with a dark skin; the sunlight makes vitamin D in his skin, and if he had been white in Africa, it would make too much. But in the north, man needs to let in all the sunlight there is to make enough vitamin D, and natural selection therefore favoured those with whiter skins. The biological differences between different communities are on this modest scale. 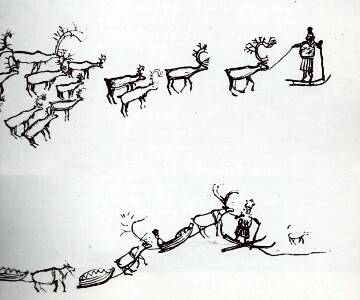 The Lapps have not lived by biological adaptation but by invention: by the imaginative use of the reindeer's habits and all its products, by turning it into a draught animal, by artefacts and the sledge. Surviving in the ice did not depend on skin colour; the Lapps have survived, man survived the Ice Ages, by the master invention of all - fire. in a landscape of ice. by a herdsman on skis. Fire is the symbol of the hearth, and from the time Homo sapiens began to leave the mark of his hand thirty thousand years ago, the hearth was the cave. For at least a million years man, in some recognisable form, lived as a forager and a hunter. We have almost no monuments of that immense period of prehistory, so much longer than any history that we record. 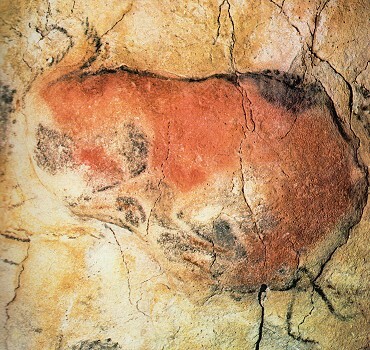 Only at the end of that time, on the edge of the European ice-sheet, we find in caves like Altamira (and elsewhere in Spain and southern France) the record of what dominated the mind of man the hunter. There we see what made his world and preoccupied him. The cave paintings, which are about twenty thousand years old, fix for ever the universal base of his culture then, the hunter's knowledge of the animal that he lived by and stalked. One begins by thinking it odd that an art as vivid as the cave paintings should be, comparatively, so young and so rare. Why are there not more monuments to man's visual imagination, as [Page 51-53, 54] there are to his invention? And yet when we reflect, what is remarkable is not that there are so few monuments, but that there are any at all. Man is a puny, slow, awkward, unarmed animal — he had to invent a pebble, a flint, a knife, a spear. But why to these scientific inventions, which were essential to his survival, did he from an early time add those arts that now astonish us: decorations with animal shapes? Why, above all, did he come to caves like this, live in them, and then make paintings of animals not where he lived but in places that were dark, secret, remote, hidden, inaccessible? The obvious thing to say is that in these places the animal was magical. No doubt that is right; but magic is only a word, not an answer. In itself, magic is a word which explains nothing. It says that man believed he had power, but what power? We still want to know what the power was that the hunters believed they got from the paintings. Here I can only give you my personal view. I think that the power that we see expressed here for the first time is the power of anticipation: the forward-looking imagination. In these paintings the hunter was made familiar with dangers which he knew he had to face but to which he had not yet come. When the hunter was brought here into the secret dark and the light was suddenly flashed on the pictures, he saw the bison as he would have to face him, he saw the running deer, he saw the turning boar. And he felt alone with them as he would in the hunt. The moment of fear was made present to him; his spear-arm flexed with an experience which he would have and which he needed not to be afraid of. The painter had frozen the moment of fear, and the hunter entered it through the painting as if through an air-lock. 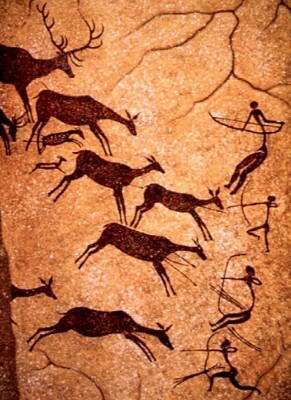 For us, the cave paintings re-create the hunter's way of life as a glimpse of history; we look through them into the past. But for the hunter, I suggest, they were a peep-hole into the future; he looked ahead. In either direction, the cave paintings act as a kind of telescope tube of the imagination: they direct the mind from what is seen to what can be inferred or conjectured. Indeed, this is so in the very action of painting; for all its superb observation, the flat picture only means something to the eye because the [Page 56] mind fills it out with roundness and movement, a reality by inference, which is not actually seen but is imagined. of what dominated the mind of man the hunter. the power of anticipation: the forward-looking imagination. Art and science are both uniquely human actions, outside the range of anything that an animal can do. 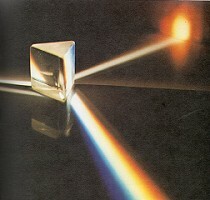 And here we see that they derive from the same human faculty: the ability to visualise the future, to foresee what may happen and plan to anticipate it, and to represent it to ourselves in images that we project and move about inside our head, or in a square of light on the dark wall of a cave or a television screen. We also look here through the telescope of the imagination; the imagination is a telescope in time, we are looking back at the experience of the past. The men who made these paintings, the men who were present, looked through that telescope forward. They looked along the ascent of man because what we call cultural evolution is essentially a constant growing and widening of the human imagination. The men who made the weapons and the men who made the paintings were doing the same thing - anticipating a future as only man can do, inferring what is to come from what is here. There are many gifts that are unique in man; but at the centre of them all, the root from which all knowledge grows, lies the ability to draw conclusions from what we see to what we do not see, to move our minds through space and time, and to recognise ourselves in the past on the steps to the present. 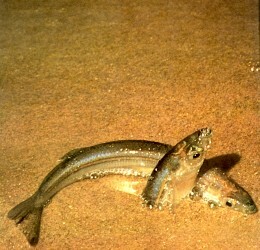 Spring spawning dance of the grunion 24 (National Geographic) p18. Computer-generated Renaissance perspective 25 exercise and DNA spiral p2, 3, and p21. a. Impala (Ed Ross) p22. 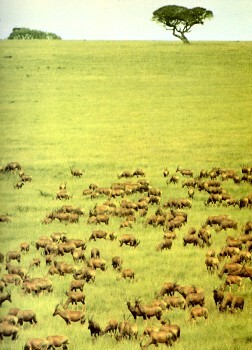 b. Herd of Topi (Simon Trevor, Bruce Coleman Ltd) p23. The Omo beds (Yves Coppens) p25. 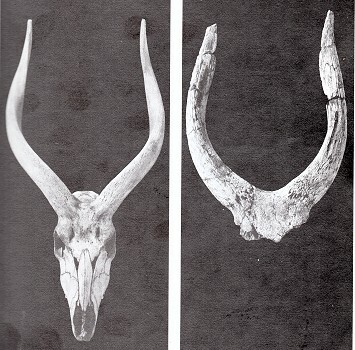 Modern and fossil nyala horns, Musde de l'Homme, Paris (Yves Coppens) p27. (Alun R. Hughes, by permission of Prof. P. V. Tobias) p28. 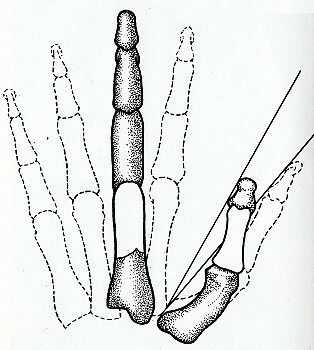 Finger and thumb bones of Australopithecus (Mary Waldron) p28. Fourteen-month-old child (Gerry Cranham) p30, p31, p32, p33. 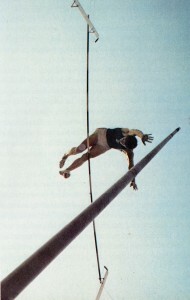 Pole-vaulter in action (Gerry Cranham) p34, p35. 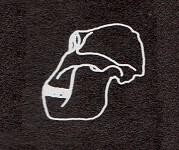 Computer-graphic display of stages in evolution of the head, p36-p37. Note that these are incomplete, the missing images reproduced below. 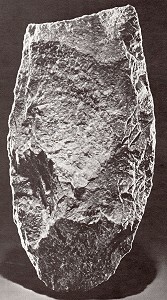 Acheulian hand axe (Lee Boltin) p39. 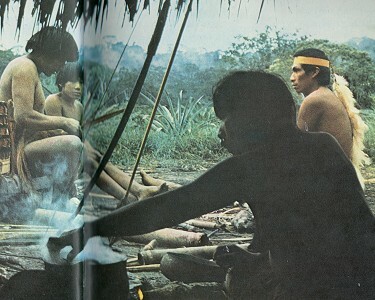 Wayana Indian hunter group (Cornell Capa, Magnum) p42-p43. a. A modern lemur (Ed Ross) p44. b. 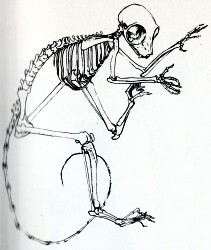 The skeleton of a bush-baby (Jonathan Kingdon, by courtesy of Academic Press) p45. a. Magdalenian reindeer horn harpoon, Ashmolean Museum, Oxford p46. b. Decorated staff, National Gallery of Art, Washington (Hugo Obermaier) p47. c. Rock painting (Erwin 0. Christensen, by courtesy of Bonanza Books) p47. 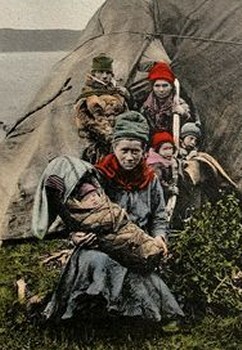 Lapp reindeer herd(er)s, 1900 (Norsk Folkemuseum, Oslo) p48-p49. a. Lapp woman (Norsk Folkemuseum, Oslo) p51. b. 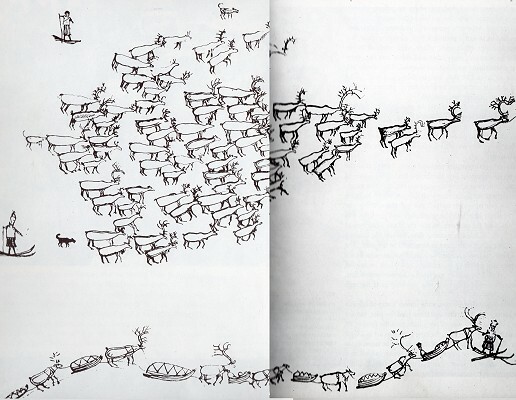 Wild reindeer herds (Gunnar Ronn) p51. Lapps on the move, drawings by Johan Turi, 1910 (Norsk Folkemuseum, Oslo) p52-p53. The illustration has been severely cropped, the double-page spread is reproduced below. 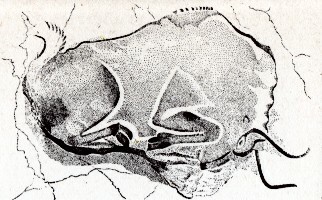 Recumbent bison, Altamira (Michael Holford) p54, p55. 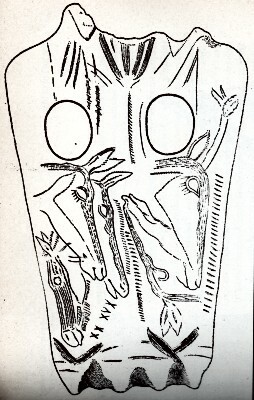 Outline of a hand, Santander (Achille B.Weider) p57. FOOTNOTES Chapter 1, Online Edition, 2016. 2. Illustration 17: pouble-page spread. 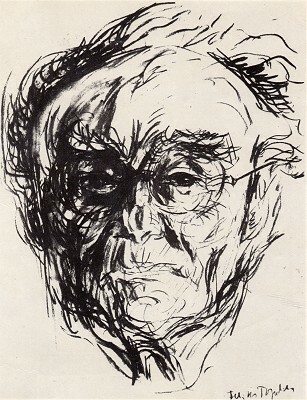 Geoff Cater (2016) : Jacob Bronowski : The Ascent of Man, Chapter 1,1973.